In preparation of our CCNA exam, we want to make sure we cover the various concepts that we could see on our Cisco CCNA exam. So to assist you, below we will discuss Configuring Frame Relay. show interface—Displays Layer 1 and Layer 2 status, DLCI information, and the LMI DLCIs used for the local management interface. show frame-relay lmi—Displays LMI traffic statistics (LMI type, status messages sent, and invalid LMI messages). show frame-relay pvc—Displays the status of all configured connections, traffic statistics, and BECN FECN packets received by the router. show frame-relay map—Displays the current map entries for static and dynamic routes. The frame-relay-inarp command clears all dynamic entries. Protocol specifies bridging or logical link control, protocol-address is the network layer and address of the destination device, dlci is the local dlci, broadcast is an optional parameter used to control broadcasts and multicasts over the VC, and payload compression is an optional Cisco proprietary compression method. Frame Relay is a nonbroadcast multi-access (NBMA) connection scheme. This means that although Frame Relay interfaces support multipoint connections by default, broadcast routing updates are not forwarded to remote sites. 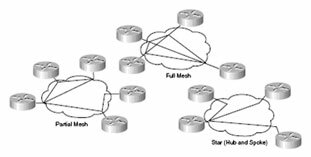 Frame Relay networks can be designed using star, full-mesh, and partial-mesh topologies. A star topology, also known as a hub-and-spoke configuration, is the common network topology. Remote sites are connected to a central site, which usually provides a service. Star topologies require the fewest PVCs, making them relatively inexpensive. The hub router provides a multipoint connection using a single interface to interconnect multiple PVCs. In a full-mesh topology, all routers have virtual circuits to all other destinations. Although it is expensive, this method provides redundancy, because all sites are connected to all other sites. Full-mesh networks become very expensive as the number of nodes increases. The number of links required in a full-mesh topology with n nodes is (n – (n – 1)) / 2. In a partial-mesh topology, not all sites have direct access to all other sites. Connections usually depend on the traffic patterns within the network. The frame-relay, frame-relay lmi-type, and frame-relay inverse-arp commands are used to configure Frame Relay. The frame-relay map command is used to configure static address-to-DLCI tables. The three WAN topologies used to interconnect remote sites are star, partial-mesh, and full-mesh. Frame Relay provides NBMA connectivity between sites, which means that although remote locations can reach each other, routing update broadcasts are not forwarded to all locations. Frame Relay networks use split horizon to prevent routing loops. With split horizon activated, if a remote router receives an update on an interface that has multiple PVCs, the router cannot forward that broadcast to routers on other PVCs on the same interface. When several DLCIs terminate in a single router, that router must replicate all routing updates and service advertisements on each DLCI. These updates consume bandwidth, cause latency variations, and consume interface buffers, which leads to higher packet rate loss. You should consider broadcast traffic and virtual circuit placement when designing Frame Relay networks to avoid negatively affecting critical user data. You can resolve reachability issues by configuring subinterfaces on the router. These logically assigned interfaces allow the router to forward broadcast updates in a Frame Relay network. Subinterfaces are logical subdivisions of a physical interface. Routing updates received on one subinterface can be sent out another subinterface without violating split horizon rules. If you configure virtual circuits as point-to-point connections, the subinterface acts similar to a leased line. Subinterfaces can be configured as either point-to-point or multipoint. With point-to-point, one PVC connection is established with another physical interface or subinterface on a remote router using a single subinterface. With multipoint, multiple PVC connections are established with multiple physical interfaces or subinterfaces on remote routers on a single subinterface. All interfaces involved use the same subnet, and each interface has its own local DLCI. The range of subinterface numbers is to 4294967293. The number that precedes the period (.) must match the physical interface number to which this subinterface belongs. The frame-relay inverse-dlci 120 command is required for all point-to-point configurations and multipoint subinterfaces for which Inverse ARP is enabled. Do not use this command on physical interfaces. Split horizon does not allow routing updates received on one interface to be forwarded out the same interface. Routing updates received on one subinterface can be sent out another subinterface configured on the same physical interface. Virtual circuits can be configured as point-to-point connections, allowing subinterfaces to act like leased lines. Subinterfaces can be configured to support point-to-multipoint or point-to-point connection types.